Have Chelsea been "found out"? Chelsea are fun this season. Not just because a king falling unexpectedly is entertaining, but because of the conflicting autopsy reports. Right now, Chelsea are the footballing equivalent of Stonehenge – we know what it is, we know it’s there, we just have a big problem with explaining why or how. The most popular explanations at the moment revolve around the team being fatigued, due to a combination of an unusual pre-season and over-use last season. The best work I’ve seen along these lines has come from Michael Caley and Sebastien Chapuis. Mourinho’s squad choices have also been illustrated by some great data journalism from John Burn-Murdoch. I remain relatively unconvinced by this line of argument. For one, Mourinho abused Chelsea’s 13/14 team, made up of largely the same group of players, nearly as much as his 14/15 one which won the title, and a huge number of those players were coming off the back of a World Cup adventure too. These are trained professionals and even with an unusual pre-season (one, notably, that was specifically designed to try and avoid the players’ fatigue carrying over) I find it hard to buy that they’re physically tired. Were ‘distance run’ data more publicly available, I could maybe look into this a bit more (for the record, the Chelsea team have been running just under the average distance in the Champions League, which is normal for a ‘better’ side). This isn’t to say that I don’t think that overuse might be a factor. Realistically, the unusual case of Chelsea’s miraculous drop in underperformance is going to be a huge, multivariate problem. And to be fair to the fatigue argument, the core of Chelsea’s 14/15 team were worked markedly harder than any other, I’m just yet to be convinced that this is the major factor. I decided to test a slightly more generic line, one that flitters in and out of punditry without much justification or explanation: Have Chelsea been “found out”? The hypothesis is relatively simple. By “found out”, we mean that teams facing Chelsea would now be adjusting their tactics in a specific way to hit Chelsea’s weaknesses. Every Premier League team will have members of staff on opposition analysis, and so it’s intuitive to suggest that once a method of attacking a weakness succeeded, other teams may try to emulate it. In Chelsea’s opening game of the season, Swansea exposed some weaknesses that had become increasingly evident through the 14/15 season. In effect, Swansea found Chelsea’s right side a particularly fruitful avenue of attack: Jefferson Montero dribbled past Branislav Ivanovic 4 times and completed 6 take-ons in total. Their counter-attacks focused on getting Shelvey the ball by getting Gylfi to take up Matic’s time and relying on Cesc leaving Jonjo free. 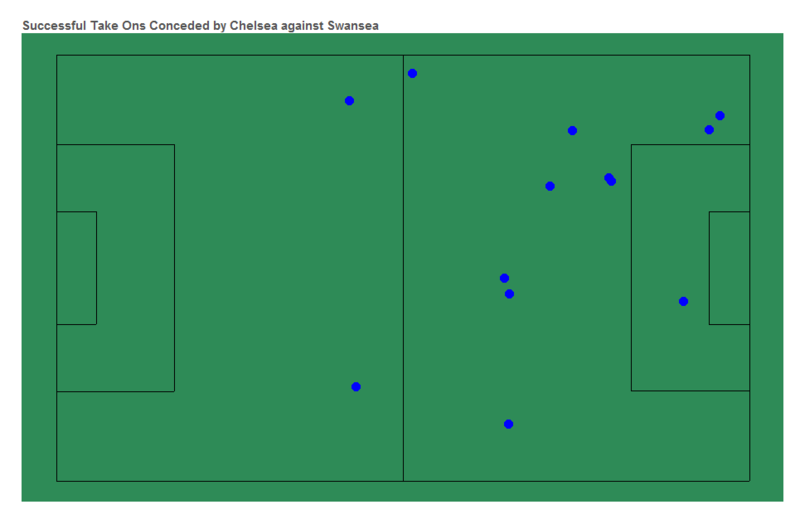 Also, Swansea’s defensive system attempted to isolate Hazard and limit his ability to pass into the box. Normally when a lesser side grabs a point away at the defending champions, they could objectively be described as ‘lucky’. But this was no typical game – Michael Caley’s expected goals model had Chelsea at a measly 0.7 xG for the game compared to Swansea’s 1.7. This isn’t to necessarily say that Swansea did anything particularly amazing, but that they may have pushed exactly the right buttons on the day and been unlucky not to come away with more. But have other teams looked to push the same buttons? To evaluate this, I decided to look into the equivalent fixtures that Chelsea played from last season, excluding the Liverpool game and corresponding fixture as my data isn’t up to date. For some context, from these ten games last season Chelsea got 21 points. This time around they got 11. If there are any obvious aggregated tactical differences between the matches from this year and last, it may be the case that teams are attacking the Chelsea problem in a slightly different way. A note on these visualisations – all data is via Opta, and the pitch is set up with the attacking team moving left to right. Above are plots comparing the key passes conceded in the same sample of games for both seasons; two things are immediately obvious – that Chelsea are conceding more chances in general, and that this increase is coming in right and centre-right areas more than it is the other side. Successful take-ons conceded tell a similar story. The prevalence of dribbles in the top right corner is striking compared to the year before, as is the lack of successful attempts to get in behind Cesar Azpilicueta. Chelsea are also giving up more successful dribbles in central areas, especially slightly to the right where Cesc Fabregas or whoever partners Matic would be expected to help cover. This has all resulted in Chelsea conceding a higher volume of high quality shots than they did in the corresponding fixtures last year, as can be seen from the rise in the number of shots in the box. Meanwhile, Chelsea’s attack is operating relatively similarly with two very noticeable differences: Eden Hazard is dribbling and producing less, and Diego Costa is having nearly half as many shots as he did per 90 last season with less than half the conversion rate. It’s worth remembering that although Chelsea did play some really good football at the beginning of last season, the second half of their season was more about grinding results en route to the title. And that as a game-plan is fine if your defence is functional, but less so if your Achilles heel has become increasingly obvious to teams about to play you. Looking at Chelsea’s successful dribbles in either sample, it’s interesting how much less Eden (or Pedro when Jose has bravely dropped the Belgian) has managed to get in behind the opposition’s right back compared to last season. This is where Eden is at his best – 1on1 with the fullback – but this season he is completing just over 1.5 less successful dribbles per 90. It’s easy to say that this is a drop off in individual performance, but it’s almost definitely related to how teams are playing against Chelsea. Note – in the below visualisations, Chelsea are attacking from the right to left. It’s possible that teams are forcing Hazard inside or isolating him so that he has no choice. Comparing tackle locations of teams facing Chelsea, it looks as if this might be the case – there seem to be more tackles on the edge of the box where Eden would be coming in. This doesn’t necessarily prove anything, but adds strength to an overall hypothesis that teams are adjusting their tactics to try and maximise their chance of frustrating Chelsea. It’s clear that, at least to some extent, teams are playing Chelsea differently this year. The harder thing to decide is whether or not this is an intentional effect of a change in tactics, as in teams “finding out” how to play against Chelsea, or whether or not it’s just Chelsea capitulating in certain areas. The hypothesis has a few strong fundamental facts to stand on, though: Mourinho’s tactics haven’t changed since last season, and neither has the majority of his team. This is almost exactly the same team, manager and tactics that won the title, which is convenient for trying to identify tactical changes of the opposing teams. Personally, I was surprised by how obvious some of the differences were between the season samples. Let me know what you think, I’m on Twitter.